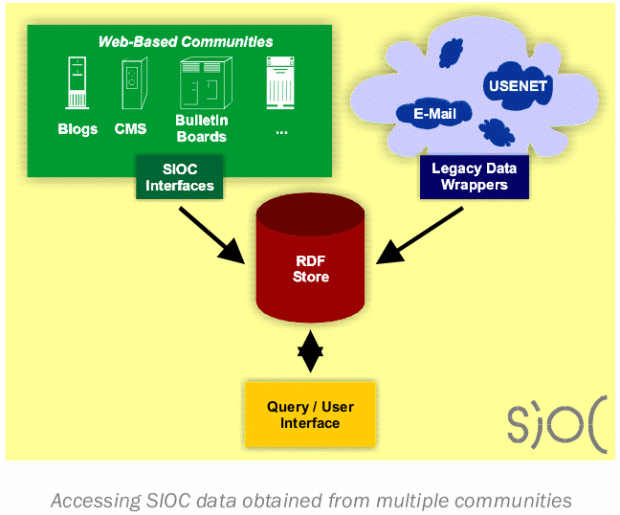 The core of SIOC is the ontology. It is a vocabulary that contains concepts necessary to express information contained in online community sites. Online community sites then provide information about their structure and contents to the outside world. This information is machine readable and structured using the SIOC ontology. In the grassroots vs. ivory towers entry I stated that one of the keys to bringing about the Semantic Web was to create plugins for popular open source Web applications such as blogs, forums, and content management systems. SIOC has an API for PHP makes the development of plugins and metadata exporters as easy as possible. The SIOC export API for PHP enables developers to create SIOC export tools without the need to get into technical details about how information is represented in RDF/XML - they are operating at the level of SIOC concepts instead. Thus, developers only have to deal with extracting content from their discussion system databases and then passing it to the API that will render SIOC data. The power of discussion methods via online community sites such as weblogs, bulletin boards and mailing lists lies in their number and the large amount of data that is available for harvesting. Most blog engines already have RSS export functionality, and some boards are beginning to export RSS as well. 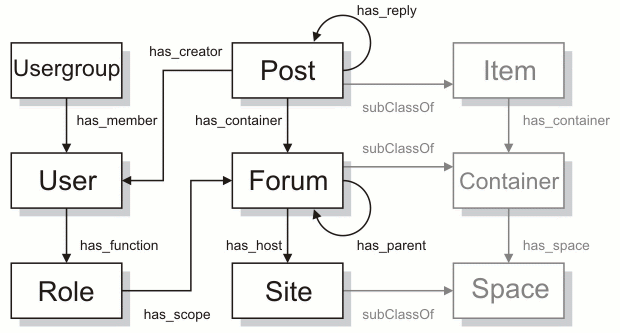 Since the majority of these discussion engines are based on open source software or can be extended by using plugins, it is straightforward to modify existing export functions or to create plugins to generate metadata conforming to the SIOC ontology. Upload a SIOC export plugin to your blog site - there are plugins for WordPress, Drupal, DotClear, b2evolution and more. Add a SIOC button to your site. Install the Semantic Radar add-on to Mozilla Firefox so that you (and a ping service) will be notified if SIOC data is present. Increased connections between sites that are discussing complementary topics via this "SIOC-o-sphere"
Relevant answers to questions rather than potentially-correct results from keyword queries, e.g. 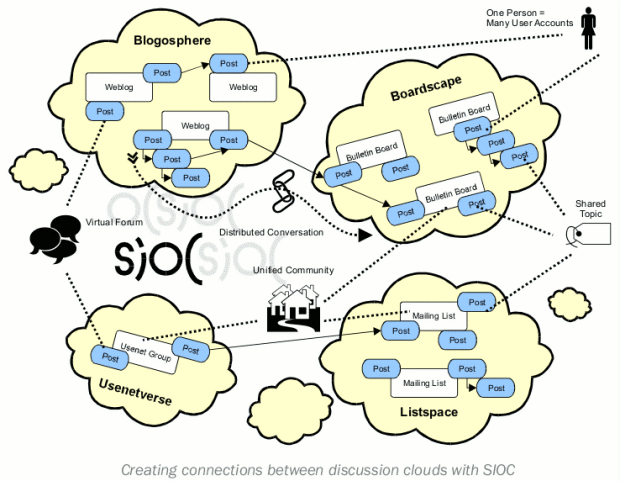 "find me all the blog posts by John and posts by anybody else who has commented on or linked to John's blog"
SIOC can be used to connect many communities by their discussions, which can lead to unbounded possibilities as far as community interaction is concerned.